How much and where did last week's rain fall? The table below provides an in-depth look. 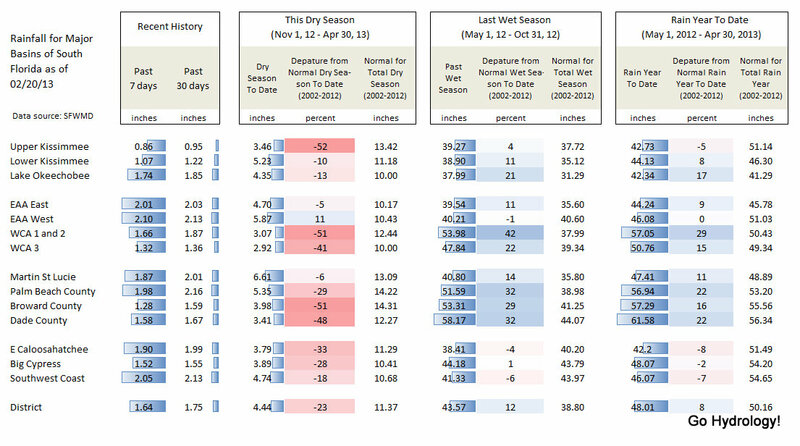 It shows recent rainfall (past 7 and 30 days), provides a dry season (to date) overview (Nov 1, 2012 - Apr 30, 2013), provides an overview for the previous wet season (May 1, 2012 - Oct 31, 2012), and also includes a Rain Year To Date (May 1, 2012 - Apr 30, 2013) overview on the far right side. The bottom row summarizes rainfall for the entire South Florida Water Management District. Data is made available by the SFWMD and the table by Big Cypress Nat'l Preserve.